Alors qu’un nombre grandissant d’entreprises et de fonds de pension européens désinvestissent ou réduisent leur relations avec des entreprises implantées dans les colonies israéliennes en Territoire Occupé, Lars Faaborg-Andersen - chef de la délégation de l’Union Européenne en Israël - prévient qu’Israël pourrait subir un isolement et des sanctions économiques. 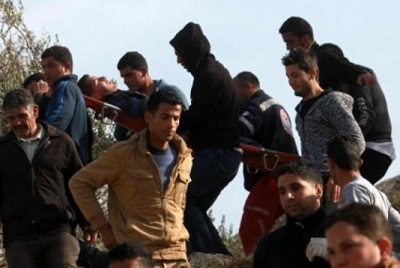 Palestinians carry a many injured in clashes with the Israeli security forces that started after Jewish settlers threw stones at Palestian farmes’ houses in the village on January 22. The EU’s deteriorating relationships with Israel went through yet another tense moment when the head of the bloc’s delegation to the country said that it could face deepening economic isolation if it presses ahead with the construction of more Jewish settlements. « We have made it clear to the parties that there will be a price to pay if these negotiations falter, » said Faaborg-Andersen. « If Israel were to go down the road of continued settlement expansion ... I’m afraid that what will transpire is a situation in which Israel will find itself increasingly isolated, not necessarily because of any decision taken at a governmental level but because of decisions taken by a myriad of private economic actors. » He said this could include companies, pension funds or consumers who shun settlement goods. Associated Press reports that a small but growing number of European businesses and pension funds have begun to drop investments or limit trade with Israeli firms involved in the West Bank settlements. Earlier in the year the EU pulled the plug on funding to Israeli organizations active in Palestinian lands, threatening Israel’s funding from the Horizon 2020 programme until a compromised was reached. Faaborg-Andersen said that while Europe is interested in improving already close ties with Israel, momentum for further sanctions could grow if peace efforts fail. But he said European officials have also held debates on possible EU-wide actions, such as labeling or even banning settlement products exported to Europe. Some individual countries have already imposed labeling laws. Under intense US pressure, the Palestinians dropped a longstanding demand for a settlement freeze when peace talks resumed last July. But they say they received assurances that Israel would show restraint. Netanyahu says he made no such guarantees, and his government has pushed forward plans for several thousand new settlement homes since the talks began. The international community, including the United States and European Union, considers the settlements to be illegal or illegitimate, and US Secretary of State John Kerry has said Israeli construction raises questions about its commitment to peace. The European Union has said that if talks fail because of settlement construction, it will hold Israel responsible. « They are illegal under international law. They make a two state-solution more difficult, and they undermine trust in a peace process, » Faaborg-Andersen said. European countries have become increasingly outspoken in its criticism of the settlements. Last year, Israel was forced to guarantee that any money it receives under the EU’s Horizon 2020 programme will not be spent in the West Bank or east Jerusalem. The EU has suspended funding to organizations active in Palestinian lands. And last week, several EU members summoned local Israeli ambassadors to protest settlement construction. Netanyahu last week accused the EU of unfairly singling out Israel for settlement construction while ignoring Palestinian transgressions. Israel’s deputy foreign minister, Zeev Elkin, said Wednesday that he had met with Faaborg-Andersen and expressed his « disappointment » over what he called the EU’s one-sided approach toward Israel. EU officials say they routinely condemn Palestinian attacks and incitement. They also have warned the Palestinians that European countries are suffering from « donor fatigue » after spending billions of dollars in aid with limited tangible results.